Choose from a selection of 18 holiday rentals in Dobre. Use the search form to the left to filter the results and pick your choice of self catering accommodation in Dobre. We have a good selection of holiday apartments in Dobre perfect for family, single, romantic and group holidays. You may prefer to take a look at our listed holiday villas in Dobre or holiday apartments in Dobre. Find your holiday homes by a specific type using the property type drop down in the filter. Filter the holiday homes in Dobre by a specific area using the area list above. Try for your holiday in Poland this holiday house in Podamirowo. Podamirowo is a small place that offers its visitors many great attractions. These two similar log houses are located on a shared plot and offer a fantastic view of the lake Jamno. Moreover, each house has a private garden area. Delightful holiday cottage in Podamirowo. We cordially invite you to a vacation in Poland. Podamirowo is a small place that offers many tourist attractions. This comfortable wooden log house is situated only about 5 km away from the Baltic Sea coast near Mielno. The house is near PPO329/ 438/ 439 and is comfortably and cosily furnished. This house with wooden beam is located on a shared meadow plot with 2 other houses. The house is very well equipped and offers a comfortable stay, close to the Baltic Sea. This wooden cottage is situated right on the lake Jamno. It has good facilities as well as many attractions. You will holiday here on a shared plot together with PPO208 and PPO209. These two fantastic beamed wooden houses are located on a shared meadow plot and are brilliantly furnished. 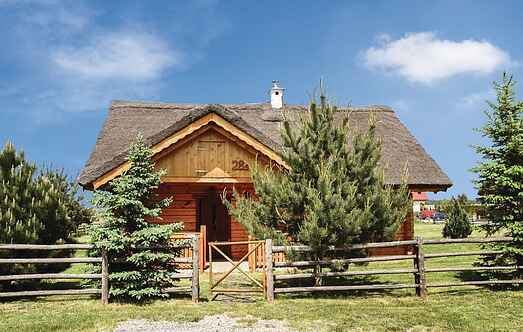 This new wooden holiday home is nestled in Podamirowo, on the Jamno lake (300 metres). This simple house is practically furnished and positioned on an enclosed plot. This beautiful wooden cottage with lake view is nestled on a fenced plot. The bedroom 1 is open and the double bed is only 140 cm wide. This cosy semi-detached house is located along with PPO438 on a shared property. Each half of the house (PPO208 and PPO209) is intended for 4 adults and 2 children. This beautiful wooden log house is situated only about 5 km from the Baltic Sea coast near Mielno. This house is near PPO329/ 438/ 439. Cozy wooden house in Podamirowo. It is simple and functional. This is the perfect place to relax with a dog. Beautiful and peaceful setting for hiking. This beautiful holiday home is situated on a fenced plot and is equipped with wonderful furniture. The property also has a playground and a barbecue area. This beautiful wooden cottage with a magnificent view of the lake is nestled on a fenced plot. The bedroom 1 is open and the double bed is only 140 cm wide.